Finally, after a year of planning, we are in Guadalajara preparing for FIL (Feria Internacional del Libro) at which the UK is Guest of Honour this year. First some facts. In terms of visitor numbers, FIL is the largest book fair in the world (765,706 compared with, for example, Frankfurt Buchmesse's 269,534, both in 2014) and probably the second largest in terms of business (1,945 publishers from 44 countries). 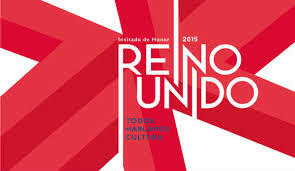 But it is much more than a book fair: it is one of the most important cultural events in Latin America. As Guest of Honour, we are responsible for organizing not only the writers programme, but also academic, scientific and children's, nine nights of music and dance, a film festival, art exhibitions, a play, and - as centrepiece - a large pavilion with bookstore, auditorium, exhibition and publishers section. In addition, our friends at the Embassy and PA are organizing gastronomic and publishing programmes. It all kicks off on Saturday, but this afternoon there's a press conference for the opening of Cholombianos, an exhibition by photographer/fashion designer Amanda Watkins about a bizarre sub-culture which thrives in Monterrey on the border with US, characterized by amazing hair and clothes. 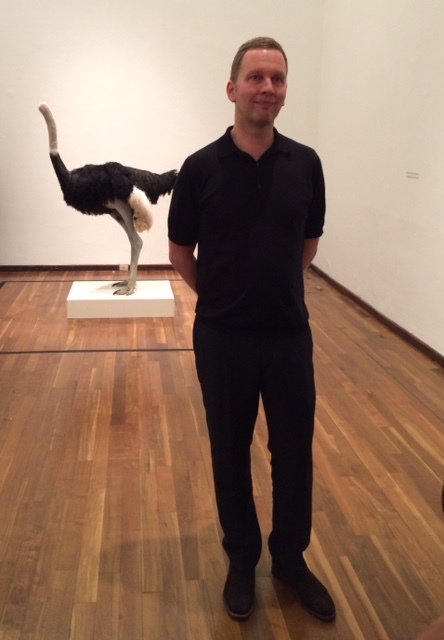 Someone who does not have amazing hair and clothes is David Shrigley, but his exhibition Lose Your Mind, which opened this evening at Hospicio Cabañas, is in many ways as bizarre as Cholombianos. A stuffed headless ostrich which stands forlornly in the entrance contrasts nicely with a bodyless, comical, robotic head which draws geometric patterns on the floor via marker pens stuffed up its nose. A giant, intestine-like clay sausage occupies another room. And his child-like pencil cartoons are everywhere, plastered on walls or projected as videos. Above all there is mordant, deadpan humour. Shrigley himself was charming, tall, plainly attired and coiffured.